The world today from an economic perspective is certainly a very different place from what it was a couple of decades ago. Countries are now intricately tied together politically and economically. As the recent Greece episode has shown, the challenges in one small country can easily develop into a global crisis. While property investors today may have developed quite the appetite for global assets, most still lack the understanding of the global economics. We hope that this article will help. When U.S. President Richard Nixon ended the US dollar peg to gold in August 1971, he started a chain of events that eventually led to the state of the global economy today. Without the need to substantiate the value of currencies, global wealth exploded. Growing at 5% annually, global wealth hit 241 trillion in 2013 and is expected to grow a further 40% to 334 trillion by 2018. Much of that was done through Quantitative Easing or simply put, money printing. In theory, people should feel wealthier, triggering more spending. 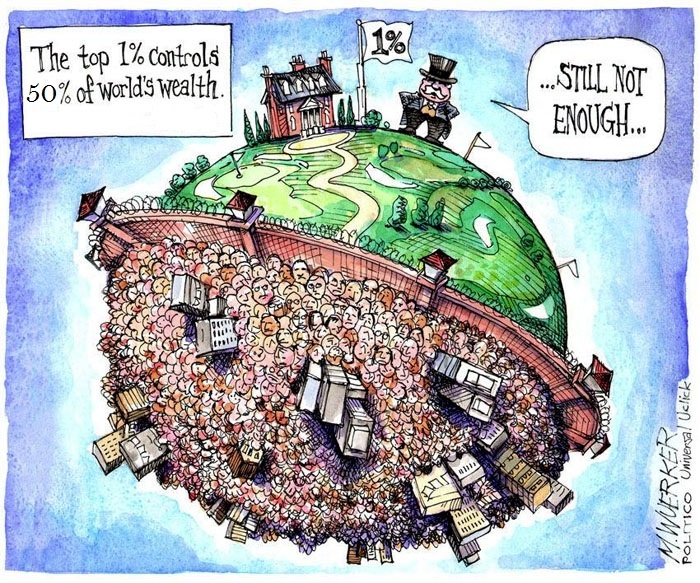 However, in reality over 50% of the world’s wealth is owned by the top 1% of the world population. Hence, wealth stuck at the top is unable to propagate downwards quickly. The situation triggered a somewhat excessive asset boom all across the world especially in key cities such as Singapore, Hong Kong, London, Sydney and New York. Given the distribution of the wealth, the asset boom was especially for what is owned or desired by the rich. The disparity between the rich and the poor only got wider. And as history has shown, whenever the gap widens, social unrest ensues. Excessive appreciation and increase cost of living can easily lead to sociopolitical challenges that will force the hands of the government to act in favour of the general population. Governments will then have to restrain the markets through higher taxes and duties, tougher policies and tighter lending conditions to rebalance the markets and bring them in line with local affordability. That is basically where the global property markets are at presently. For the next 12 to 18 months, after a run of strong asset appreciation, we are expecting a recalibration of policies and constraints on the property markets especially at the top ends of the markets where foreign participation is rampant. In the UK, an additional stamp duty of 3% is now payable since 1 April 2016 for buy-to-let investors and second home buyers for property values above £40,000 (approximately RM250,000) and up to 15% for values above £1.5 million (approximately RM8.79 million). The possibility of UK exiting the European Union and the current peak prices in central London is also exerting further downward pressure on prices. This has led to a steep 45% fall in transactions all across UK in April 2016, with some prices in prime central London discounting up to 10% to attract buyers. In Australia, we are seeing additional foreigner levies being considered or implemented by all the major cities as well as tighter lending conditions. Across Hong Kong and major cities across China, we are seeing mortgage tightening measures where buyers have to come up with as much as 60% deposits. Debt servicing ratio is also being targeted in an effort by governments to prevent over-leveraging with Singapore setting it at 60% over-leveraging 40% of income, down from its previous 50%. Similarly, Malaysia has implemented borrowing constraints, minimum price points for foreigners and additional taxes to regulate its market. One can arguably deem that the restraints are necessary only because real estate continues to be the one asset class that has the best risk reward ratio. We tend to agree with that, given the level of risk in the equity markets presently, and the mix of potential market woes including China’s slowdown, anticipated rate hike in the U.S., the oil crisis, Brexit and global terrorism. Any one of these dozen or so risk events can send the markets reeling back to the crisis state of 2007/08. On the other hand, the low-interest rate environment around the world continues to favour real estate investments. In a survey by Colliers of more than 600 significant investors, over 52% concluded that they will increase their allocations for real estate in 2016. Los Angeles, San Francisco and New York are the darlings of U.S., while London is preferred in Europe followed by Paris and Frankfurt. Japan and Australia top the list for Asia with Hong Kong, China and Singapore close behind. We have to admit that the mixture of risks and opportunities is somewhat a confusing cocktail for investors. While the current market does offer a plethora of opportunities, each must always be researched and carefully managed. Real estate remains our favourite instrument to help our clients achieve sustainable wealth and one which we believe will outperform the other instruments, especially in these turbulent times when bought correctly.